World premieres, time-honored classics, special exhibitions and a tribute to a South Korean master auteur are among the delights in store for avid moviegoers Oct. 4-16 at this year’s Busan International Film Festival. 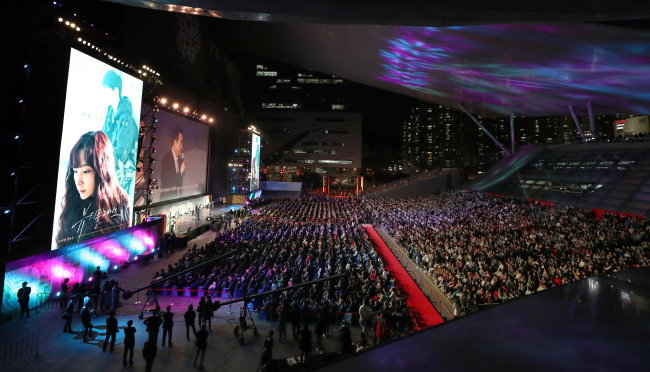 The 23rd annual BIFF kicked off Thursday evening with an opening ceremony hosted by actors Kim Nam-gil and Han Ji-min at the Busan Cinema Center’s outdoor theater. The venue was filled to capacity with a crowd of 5,000. Despite storm warnings, attendees lucked out with nothing more than light drizzle. Japan’s Sakamoto Ryuichi, widely acclaimed for his movie scores, added color to the event with his immaculate piano performance. Some 250 stars and directors stepped on the red carpet even before BIFF Director Lee Yong-kwan and Executive Director Jay Jeon officially declared the start of the ceremony. They included Lee Na-young, the leading lady in the opening film, “Beautiful Days,” as well as Jang Dong-gun and Hyun Bin. Busan Mayor Oh Keo-don, whose plans to kick off BIFF were pre-empted by a last-minute invitation to visit Pyongyang as part of a South Korean delegation, sent a video message conveying his wishes that the festival would achieve a “leap forward” this year. “I hope this will be the first year that the festival will normalize and leap forward, washing away the distrust (of the BIFF) that was caused over the screening of ‘Diving Bell,’” he said. He was referring to the controversy that emerged in 2014 after BIFF screened a documentary about the tragic Sewol ferry disaster earlier the same year. The film was critical of the Park Geun-hye government and the incident led to an extensive government audit of the festival’s executives, the dismissal of key players, budget cuts and a hit to BIFF’s reputation as numerous cinema groups boycotted the event. The number of films to be shown this year has increased by 20. Altogether, there will be 324 films from 79 countries, including 115 world premieres. Among those was the opening film, “Beautiful Days,” which premiered Thursday. The film mulls over the meaning of family, showing a broken family reunited and reconciled, which is fitting given that this year’s theme is reconciliation and normalization. A new program, Busan Classic, will take a look at 13 films that have left a lasting impression on the cinema. The Gala Presentation starting Friday will feature “First Night Nerves” by Stanley Kwan of Hong Kong and China, “Killing” by Tsukamoto Shinya of Japan and “Ode to the Goose” by Chinese-born Korean Zhang Lu. The closing film is “Master Z: The Ip Man Legacy” by Yeun Woo-ping. The festival will take place at the Busan Cinema Center, Lotte Cinema Centum City, CGV Centum City, Megabox Haeundae and Dongseo University’s Sohyang Theater. While organizers and participants are looking forward to the festival, the coming storm has already put a damper on it. Earlier in the day, officials dismantled the outdoor stage at the BIFF Village on Haeundae Beach, the original venue for dialogues with actors as well as other events. Those events will instead take place indoors, at the Busan Cinema Center. An outdoor concert by Korean singing legend Cho Yong-pil, originally slated for Sunday, was also canceled along with other outdoor events. Friday’s weather forecast calls for rain, which is expected to last all day and could continue well into the weekend.